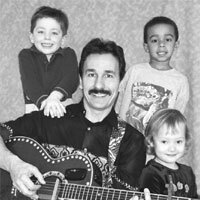 About The Artist: For nearly two decades I have been writing and performing family style music for the young and young at heart. I live in Kittery with my wife and two children. I have been a professional musician for over twenty years. After the birth of our first child I started writing children’s music. This has been a “dream come true”. Writing music and playing for kids is the greatest. I perform at schools, preschools, libraries, festivals, and children’s events from Maine to Maryland. I was invited for three years in a row to perform at the “Little Ducklings Parade” in Boston. I have performed before thousands of kids but some of my favorite performances have been with smaller groups like the Perkins School for the Blind in Watertown, MA. It’s always a thrill to have kids singing along with me to my own music and I love to receive little notes and cards from kids, telling me how much they enjoyed a show or one of my songs. Sometimes I think I must be “One Lucky Guy”.